“The US-UK ban on selected electronic devices from the passenger cabins of flights from some countries in north Africa and the Middle East was partly prompted by a previously undisclosed plot involving explosives hidden in a fake iPad, according to a security sourc,” Ewen MacAskill reports The Guardian. MacDailyNews Take: On the bright side, iPhone 7 Plus sales are set to explode, er… increase greatly in areas affected by the ban. Presumably, less volume = less space to fill in with bad stuff. Who wins? The terrorists. Who losers? Everyone else. This is total BS! it is just going to get worse over time and the restrictions on carrying electronics will continue to be clamped down even tighter. especially once the terrorists figure out how to use their iPod or iwatch (or their equivalents) to remotely trigger their high explosive laden laptop packed safely away in the cargo bay. they will figure out a way, they are smart and devious and motivated. all these terrorists need to do is fly from airports not in the countries singled out thus far. Yeah…I don’t get that laptops are judged inherently ‘safe’ because they are in the hold. Pretty pointless as long as some aurports (like Istanbul) allow mingling of travellers from incoming and outgoing planes AFTER security checks. I *think* I know what you’re talking about, but you’ll have to clarify, because right now “allow mingling of travellers from incoming and outgoing planes AFTER security checks” reads as no different than most airports. The only European airport I’ve used that doesn’t completely separate arrivers and those departing is Amsterdam Schipol. Transfers normally require the arrivers to pass through metal detectors etc. again. Ironically, I think this separation was put in place on the insistence of the US FAA following Lockerbie, whereas I’ve never passed through a US airport that has the FAA’s required design in place. Most of the airports I’ve used in Africa are the same. Check in, baggage collection, customs and passport control – all are chaotically organized with hot desk swapping as needed. Even in South Africa, there was no luggage check for my feeder flight from an outback airstrip – it went straight onto my international flight. Bizarre and…gulp! From my experience the mingling is possible only with domestic flights. International flights (at least for the US and Japan) are as separate as can be with the need for customs and immigration. It used to be that you had to demonstrate that the unit was working (and not just a shell filled with explosives). Bombers will plant explosives in their bodies. Therefore, using this logic, airlines would have to ban passengers. Not to be callous but why are airplanes considered such a big deal when stadiums are wide open to drone attacks? Why do we ignore violent deaths caused by deranged domestic killers on the ground and then treat aviation as if these planes were made of paper mache? The picture of that airplane shows it landed safely. Almost everyone walked away. Planes are tough. A bomb on an urban sidewalk would do as much damage if not worse. If you are so paranoid that we allow ourselves to turn our free nations into police states for the illusion that everyone can be perfectly safe, wake up. Go lock youself in a bunker id you want to be safe. Thousands of motorists and pedestrians are killed each year, if life was so precious, we would put effort into safe sidewalks and pedestrian overpasses. We would require citizens be trained to understand and identity psychologically impaired people. We would actually enforce cell phone driving laws. But no, personal accountability is just too much. Instead the lazy society will demand government solutions–which means corporate solutions since the TSA is basically just a lobbyist gift to the GE scanner business. Now banning devices which could easily be proven to be genuine computers with a simple touch of the power button is another example of the military industrial complex growing bigger and more intrusive into our personal freedoms. We have the duty as citizens to be vigilant in protecting each other. I don’t see the value in the TSA or the British nannies treating every passenger like a criminal, stealing every knitting needle and jack knife as if we are all helpless wimps. Or are we now helpless sheep? Indeed! The numbers of Americans killed by US corporations makes the total of terrorist attackers look like a bunch of Sunday School teachers. And I do mean KNOWINGLY killed as with tobacco, various drugs, unsafe vehicles and much, much more. Airlines/Airports are considered controllable points of entry/exit and can be effective in greatly increasing the prevention of mishap. Stadiums also have a certain level of security involved even if it just to check tickets. You mention drone attacks as if aircraft or airports are immune to those same external attacks. 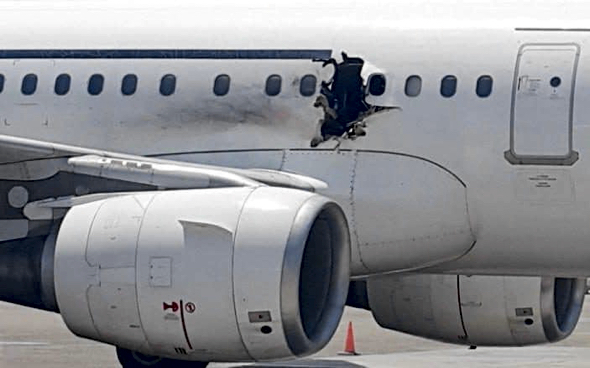 In many cases non-commuter flights travel at higher altitudes which make explosive decompression a very serious concern, not to mention where the debris would land. Judging by the size of that hole in the photographed plane it appears to me the explosion took place at a much lower altitude than 35k ft.. Agreed that we shouldn’t allow ourselves to turn our nations into police states, however if we can prevent a significant portion of those events from occurring we should be prepared to find the balance we can accept and not go the other direction to not having security at all. As it is we all agree that a police force is necessary at the city/county level and we pay for it through the taxes we pay. If we want safer sidewalks and pedestrian overpasses and the citizens agree, that will probably result in higher taxes to enable that option. The fact that cities don’t do so is that the citizens are not willing to tell their representatives to move the city to do so and perhaps at the same time unwilling to pay for it through an increased tax. You speak of personal accountability as if you are actively doing something yourself to help increase awareness or actually active in implementing solutions to protect at least the people in your community. The device ban is the simplest, most cost effective solution that people would accept as a condition for using air travel. I’m sure those responsible would love to hear your cost effective idea. There was a case in the 80s that involved a simple battery powered radio. The batteries that powered the device were specially designed to be bombs but also provide the proper voltage to the device it was installed in (the radio). The radio was checked and it worked fine as it should. The plane took off, landed offloaded some passengers (among of which was the bomber) and took off again with the radio still in the overhead bin. Needless to say the bomb went off and plane went down. A simple on/off check has already been proven to not work as a preventive test. I will agree that the TSA rules for some of the potential ‘weapons’ are pretty weak and should be abolished since a trained killer could easily turn other normal objects into makeshift weapons when needed. UK considers the UAE and Qatar to have high security measures in place at their airports. Good riddance, if those half-sleeping individuals who barely check anything being pulled through their scanners are classified as great, then we do have a problem. It’s absurdly obvious how the real reason behind this exemption is that more than half of London is made up and paid for by GCC Arabs.